U.S. Veterans Magazine recently announced that Bellevue University is a Best of the Best Top Veteran-Friendly School. According to U.S. Veterans Magazine, the Best of the Best lists are compiled to support their readers - veterans, transitioning service members and veteran business owners - and link them to employment, business, education, and supplier opportunities. Best of the Best honorees were chosen through market research, independent research, diversity conference participation, and survey responses and are based on their openness and support to veterans. "We're gratified to be included in this exclusive listing of schools that are the best in the nation at serving veterans," commented James Biernesser, Col. USAF Ret., Director of Military Programs for Bellevue University. "Military service members and veterans have been a focus of our school since its opening more than 40 years ago." A recent Bellevue University initiative, designed to serve post-9/11 Veterans, captured the attention of judges for this honor. Called Veterans Initiative for Advancement (VIA), it is an unprecedented suite of services that provide Veterans the help and resources they need to be successful in their transition to civilian careers. VIA includes free, personalized self-assessment tools, courses designed in collaboration with Veterans to ease the transition to civilian life, and specialized Veteran advising services. 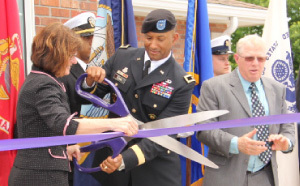 Brigadier General Jason Evans, a Bellevue University Alum, cuts the ceremonial ribbon to mark the opening of Bellevue University's Military Veterans Services Center. Assisting Evans are Bellevue University President Mary Hawkins (left), and retired Air Force Colonel Jim Biernesser (right), Director of Military Programs at the university. Last month, Bellevue University opened the new Military Veterans Services Center (MVSC) on the Bellevue campus that features specially-trained military and Veteran advisors, a meeting place for support groups facilitated by a VA representative, career services, and the home of the Bellevue University Student Veterans Association - one of the largest chapters in the nation. "While this is an honor, all the accolades in the world don't hold up to the satisfaction we get from serving America's Veterans," said Michael E. Echols, Ph.D., Vice President of Strategic Initiatives for Bellevue University. "These are our nation's most well-prepared, loyal, and dedicated individuals - those ready to enter organizations and earn their stripes; those making major contributions every step of the way." The Best of the Best award is another in the long list of accolades for Bellevue University in supporting Veterans. In 2013, Bellevue University was also ranked No. 3 for Veterans in Best Online Programs by U.S. News & World Report and is in the top 10 for Top Online Education Program Rankings in the category of Best Online Bachelor's Degrees.